I recently went to Japan, to Tokyo this time. And there, I’ve been hunting for nice stationery or paper-related shops and places. Here are the nice addresses I found. 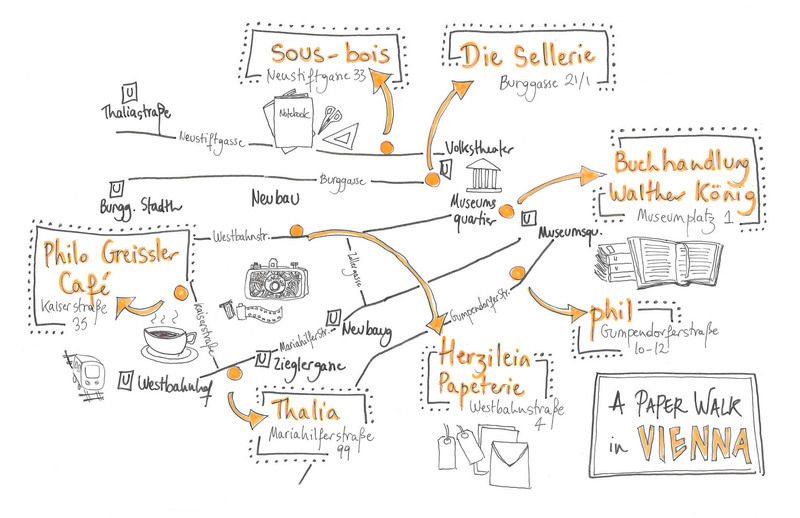 You’ll find why I liked it below, district by district, and you can see where it is in the city thanks to a map, working with what3words addresses (starting with “///”). Hope you’ll like it! 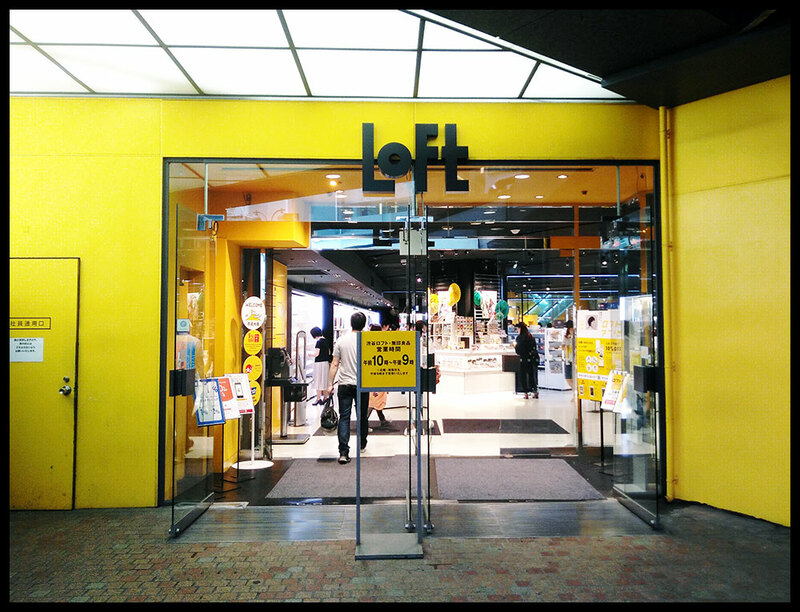 Loft is a big department stores chain and it its Shibuya branch, at the basement, you’ll find a large selection of stationery in the pure Japanese style. 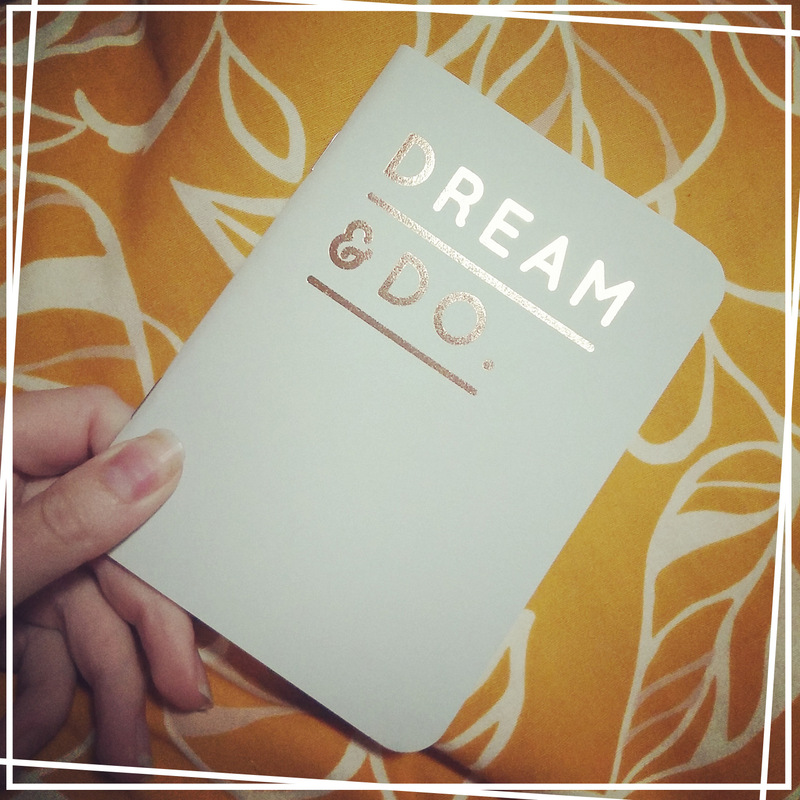 Notebooks, pens, diaries, cute stickers and post-its… it’s all there! I recommend going there instead of Shibuya’s Tokyu Hands, which I found disappointing (and old-looking, compare to the other ones I’ve seen in Japan). It’s not the super busy Starbucks Coffee overlooking the Shibuya crossing… but it’s in the same building and there you can drink your coffee in peace, among books and magazine, right in the heart of Shibuya. To find it, get in the Tsutuya books and DVD store, and get to the 7th floor. You’ll find a place to chill surrounded by books as well as cool Japanese and international magazine (yes, yes, they have Frankie!). In a basement again (whose entry isn’t that easy to find, so stay alert), a small coffee shop and restaurant coupled with a stationery shop, with varied and original products. It’s next to a big 7-eleven in a not too small street, so don’t get lost in small alleys to find it, like I did! 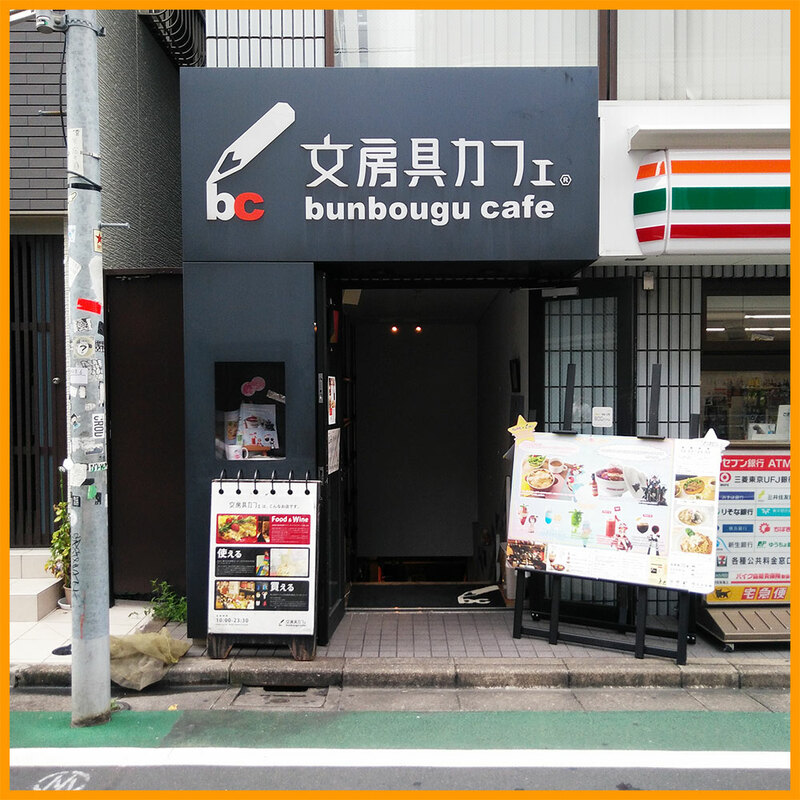 Very near to Bunbougu Café, on a 1st floor this time, a nice gift shop selling lovely articles from Japan and everywhere else. They have a range of nice postcards. At the end a quiet street in the hip neighbourhood of Shimo-Kitazawa (where the trendy youth of Tokyo gathers to buy vintage clothes), a small shop selling almost exclusively postcards of all kinds (including postcards with pictures of these famous international celebrities). They also sell some stationery, like masking tape and letter sets. There I found in love with the beautiful calendars from the brand Ryu-Ryu, with cute pastels illustrations, so Japanese! Suzuran-dori in Jimbocho district is a street famous for booksellers, but don’t limit yourself to this street only. The whole area is about books, the main street at the exit of the subway too, for instance. 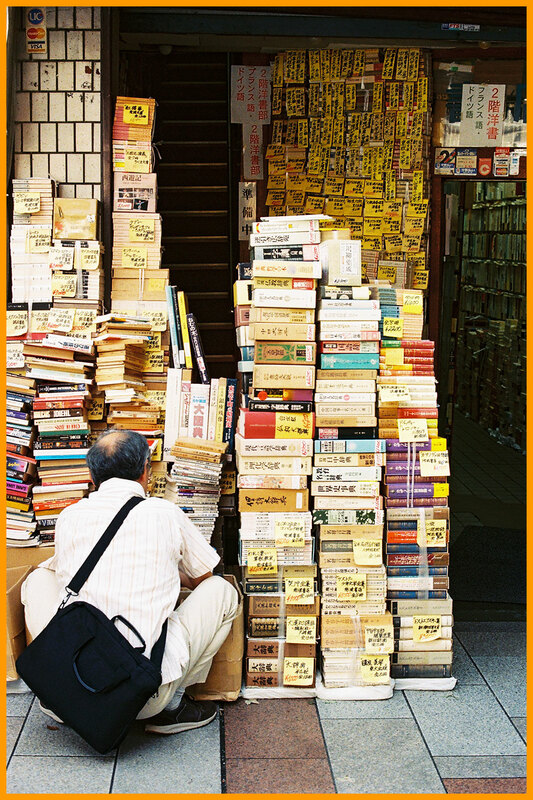 You will find mostly Japanese second-hand books in small shops, and tons of it. Piles and piles of books actually. Some shops do sell foreign language books too (I spotted some Russian ones), as well as English edition. You also have regular bookshops selling new editions. Funnily, most stalls will be exposed to the North, to avoid the sun and preserve the books’ covers. A quiet coffee shop to have a break in a studious atmosphere, close to the books sold by this chain. On the first floor, you can seat overlooking Suzuran dori while drinking your morning tea or coffee. At the end of Suzuran-dori, another art supplies store selling goods for paper lovers. They have a great selection of postcards, notably the whimsical one from Kyupodo. For those of you with kids to spoil, they sell flip-books from the publisher Seigensha, funny and poetical at the same time. As I was leaving the Jimbocho area, thinking I had seen it all, I stumbled upon this marvellous shop, specialising in maps. Its window caught me by surprise, with beautiful maps displayed. I hesitated before entering, for it can look a bit intimidating, like it’s a place for real specialists (which it is probably). The walls are covered with shelves containing maps, it’s like Ali Baba’s cave. If you’re not a map nerd and are looking for something accessible, they sell reproductions of old-Japanese maps, like this map of Edo I got there. We found that lovely store by chance, even though it is featured in the Herb Lester guide of Tokyo I had with me. I can see why they recommended it! 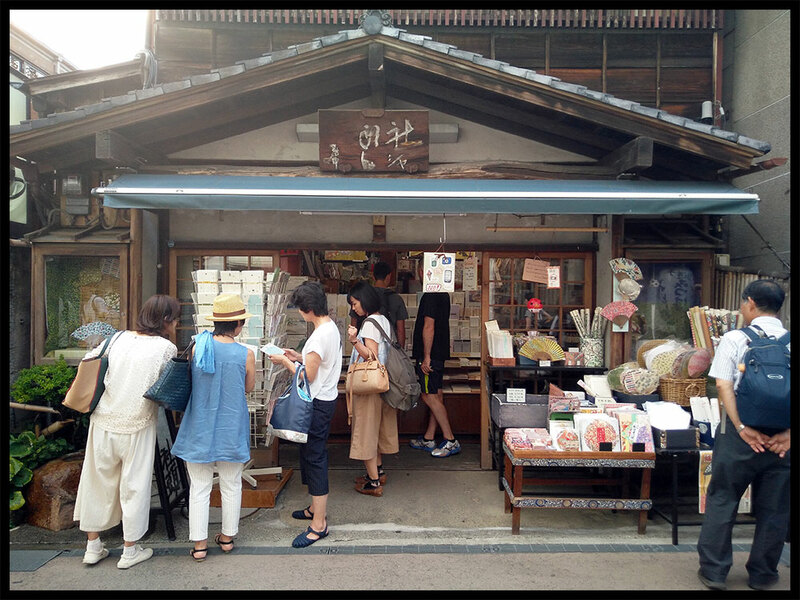 In the quiet and traditional area of Yanaka, near Sendagi station, Isetatsu is a very beautiful shop selling articles relating to “Chiyogami” – that is, paper printed using an ancient technique, with traditional patterns and typical Japanese designs. Sheets of paper are sold by the unit, ranging from 162¥ (that’s less than 1,5€). You can use it for gift wrapping, origami, to cover books, or whatever you want! They also sell goods using these very sheets of paper. I have to admit I’ve been disappointed by my visit to Maruzen Nihonbashi. Probably because I was expecting a lot, since Maruzen has been a great discovery when I visited the island of Kyushu last year. Other branches offered a lot of stationery and for some reason, I found this Maruzen store wasn’t up to my expectations. But I must do them justice. They have a great range of stationery, so if you’re a stationery lovers, if you find some day a Maruzen on your way, you should definitely pay a visit. And unlike me, if you do find the flagship store near Tokyo station (there: known.ending.synthetic), I’m sure you won’t regret it! A small stationery shop, like one you would expect to see in a residential neighbourhood: quite simple, selling everyday stationery items. They also sell some interesting items for a visitor like you, for instance, they have a nice selection from the Midori collection. A good surprise. This is the name of the Ginza branch for the well-known Tokyu Hands brand. 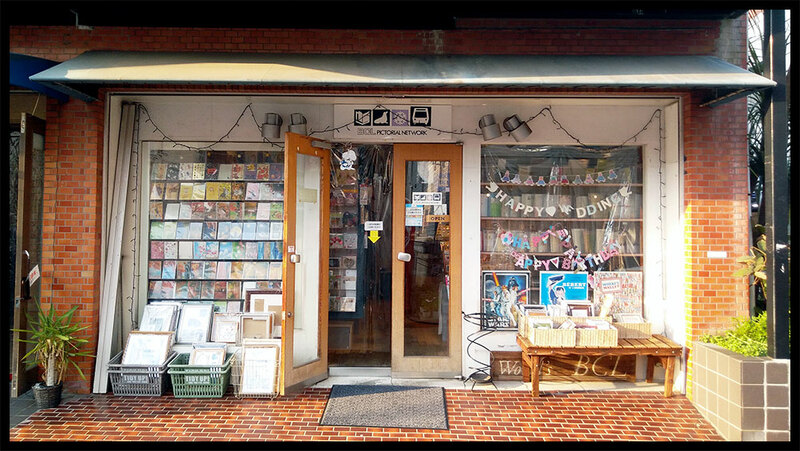 If you’re shopping for stationery in the area, it is a good stop, a kind of safe bet, as you’ll find all the Japanese classics in stationery there. And lots of other wonderful things! That is THE stationery paradise in Tokyo. If you go only make it to one of these stores, that’s where I recommend going. It spread on nine themed floors (meetings, craft, travel, etc. ), and sell from traditional paper sheets to the most famous stationery brands, and all the basics. You have enough to spend the afternoon there, and if you want more, goods news, they have another store around the corner! You can create you own customised notebook on the 4th floor. It is rather a traditional art supplies store, more than a stationery one. 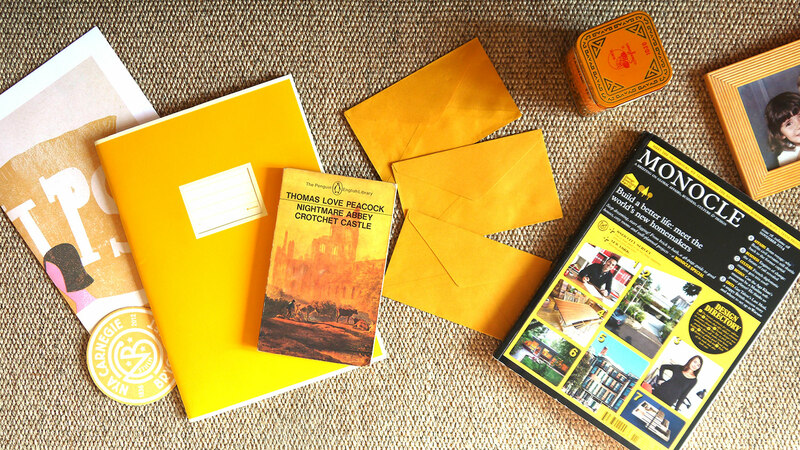 The ground floor is dedicated to the Japanese basics of stationery and to a generous range of typical postcards and letter paper for the correspondence. They have beautiful and delicate designs, and their postcards stand out from what you can see elsewhere (and it’s cheaper too! – 800¥ for a card). The 2nd floor is mostly about painting and art supplies and has an interesting choice of brushes and pigments. 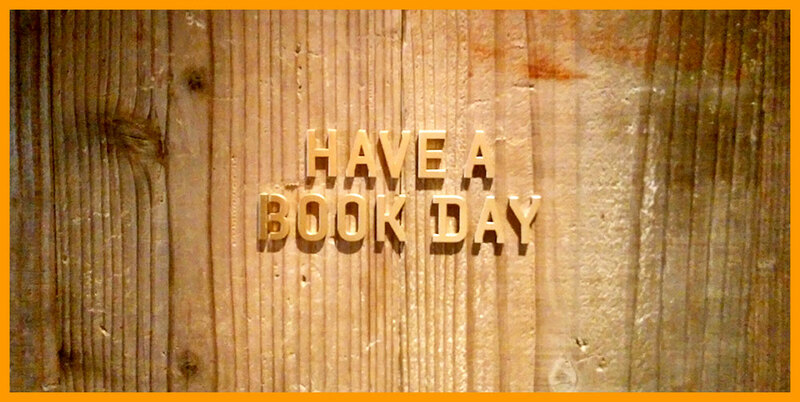 To change from the stationery shop or cafes, here is a hostel for the book lovers. It’s quite recent, and honestly, I’ll recommend it only if you are a real fan of sleeping among books and/or you’re curious to try the Japanese-style hostels. I’m talking about sleeping in small wood boxes where you can hide from the world, instead of traditional bunk beds or even tatami rooms. Not for the claustrophobics of course! I was surprised how spacious and convenient it is in the end. But if you’re looking for a friendly atmosphere where you can meet people, this is not the place for you. Unfortunately, the lack of space and of a kitchen makes it not very to socialise. But it’s a good experience with a nice location. And books everywhere! If you happen to visit the city of Kamakura (about an hour from Tokyo), make sure to go to Shatoh, another temple of Japanese paper. It is so beautiful and it typical that it isn’t allowed to take pictures in there anymore. They sell roll papers, individual sheets (still in the same distinctive Japanese style) as well as by-products. All this with either traditional patterns, or modern ones. 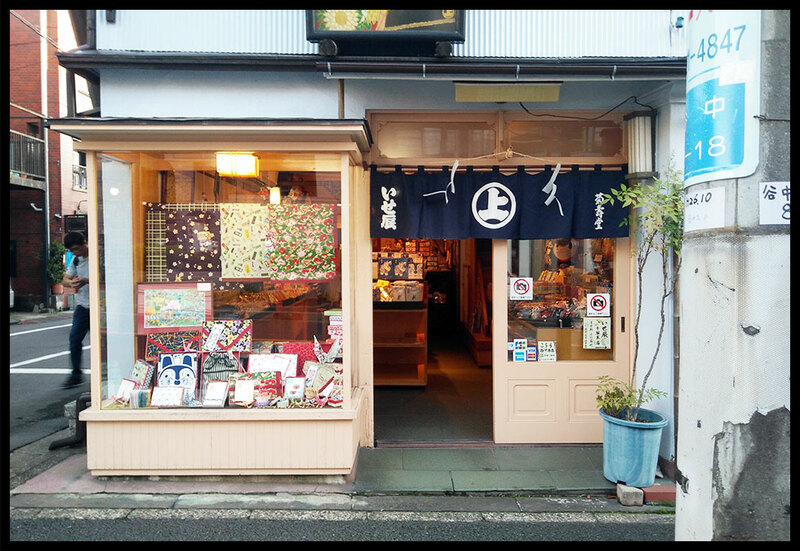 The Japanese art of paper in its full splendour awaits you in this small shop! I was helped in my hunt by this article, The 10 Best Stationery Stores in Tokyo and The Herb Lester Tokyo guide.